This special edition of the literary journal Dreadlocks incorporates proceedings from Oceans, Islands and Skies - Oceanic Conference on Creativity and Climate Change. The conference highlighted the role of writers, artists and the media in environmental challenges in the Pacifi c... read full description below. 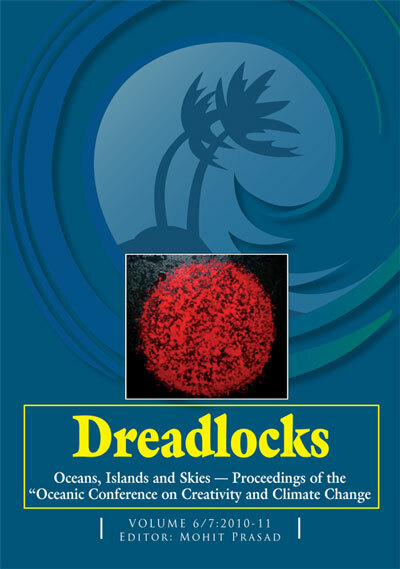 This special edition of the literary journal Dreadlocks incorporates proceedings from Oceans, Islands and Skies - Oceanic Conference on Creativity and Climate Change. The conference highlighted the role of writers, artists and the media in environmental challenges in the Pacifi c. The conference was held from 13-17 September 2010 at the Laucala Campus of the University of the South Pacifi c in Suva. The proceedings from the conference refl ect on the rationale that Oceania has always had at its core traditions creative expression that empowered us in our relationship with the environment. The conference papers, presentations, community events and the associated artists and writers festival that are included in the proceedings provide an alternative culture of responses to issues like climate change. This publication exemplifi es the synergy of creative spirits with academic papers and presentations from across the humanities, social sciences and scientifi c and environmental knowledge to better serve the Pacifi c in facing climate challenges. Publication was assisted by a grant from AUTs School of Communication Studies. The book is edited by Dr Mohit Prasad and includes a chapter by Professor David Robie, director of the Pacifi c Media Centre, editor of Pacifi c Journalism Review and former journalism coordinator at the University of the South Pacific. REVIEW: Oceans, Islands and Skies, Volume 6/7 of Dreadlocks, is a reflection of "an attempt to insert a marker into the [climate change] debates through an Oceanic perspective". It comprises of a collection of the papers and proceedings of the Oceanic Conference on Creativity and Climate Change - the role of writers, artists and the media in environmental challenges in the Pacific hosted in September 2010 by the University of the South Pacific. The conference was imagined and largely organised by Dr Mohit Prasad and his team, who edited and saw the Dreadlocks issue to publication by the USP Faculty of Arts, Law and Education in association with the Pacific Media Centre in the School of Communication Studies at Auckland University of Technology. The tone of the conference was set firmly in the keynote speech by Dr Cathie Koa Dunsford, New Zealand academic, writer, publisher and film maker, who spoke of the urgent need to "return to our traditions...and art forms to find ways in which we may all survive on this planet together", to use creativity to find alternative solutions. She states that "sustainable living is the only way we can share resources with all people", a philosophy without "borders or languages...."that potentially can be shared by all people on this earth if implemented communally". This philosophy was echoed by Dr Koa Dunsford's environmentalist and writer colleague, Dr Karin Meissenburg, in the final keynote speech that discusses further their innovative Kaitiakitanga island permaculture design course. She emphasises that ecological answers, like spiritual answers, are always locally specific which is why it is so paramount to retain local cultures and languages, despite the common ground that crosses continents. "A climate change of heart, a climate change of consciousness, that is what we are concerned with, going beyond being hypnotised by fear, working with the courage of love....this will enable us to deal in a creative and practical way with the climate crisis." These creative and practical ways are described from the various perspectives of the conference participants to make sound sense of the idea that creativity and the ethos of Oceania are vital to how to deal with climate change. Media warrior and journalism professor David Robie examines the muting of the media as the corporate nature of the industry becomes dominant in the context of environmental migrants. He warns that society needs more from the media and rolls out former Inter-Press Service bureau chief Kunda Dixit's eco journalism code that includes taking a "video" not a "snapshot", being there after the parachute journalists leave and not moralising or flagwaving. He sees a major problem in "the media mindset focused on 'compulsive reporting of events', however trivial, at the expense of more comprehensive process journalism, which is what is needed in climate change journalism". A practical approach is also taken by Keron Niles in a paper on climate change, trade and competitiveness of the tourism sector in small island developing states, examining the case of the Caribbean and attempts to explore alternatives to the traditional tourism products of sun, sea and sand with such ventures as heritage and community tourism. A moving account of the increasing numbers of children being affected natural disasters, 67 million a year for the past decade, and practical experience of what communities need to help them overcome their losses is discussed by Jeremy Dorovolomo of USP Solomon Islands. Poet Cresantia Frances Koya of USP examines the potential of art and culture as an education for sustainable development effort, looking at art and events such as festivals and canoe voyages that have been vehicles of advocacy and awareness. Sustainable development is interrogated further by USP law lecturer Nilesh Bilimoria as an ethical and moral idea, but questions whether it has in essence practical legal effect. He concludes that the tide to do so has been 'moderately swift' but it will be a long journey. Another poet, Susan Hawthorneof James Cook University looks at the nexus of ecology and poetry and seeks a complete overhaul of economic systems to move to a world inspired by biodiversity, "a wild politics" in which theft of intellectual property from indigenous peoples would be unthinkable and war will not enter the mix. Pacific poet Pio Manoa dares dip his bread "in the old, old wine" in a retrospective piece in which he reviews some of the positive strengths of the Vanua including the Fijian concept of peace, Sautu, and resists charges of romanticism. USP Associate Professor in Development Studies Dr Manoranjan Mohanty also explores the potential of creative expression through art, song, dance, drama, paint, street play and stories to express environmental relationships and values and promote environmental values and behaviour. Briar Wood of London Metropolitan University notes in her paper on science in the poetry of Oceania that while the two culture debate may no longer be relevant in historical or regional terms, science and poetry do draw on different techniques, histories and discourses. She quotes Richard Dawkins, that poets could better use the inspiration provided by science....at the same time scientists must reach out to....poets. She concludes: "Bioregions are heterotopias, as an awareness of each multiple others' culture, beliefs and relationship to the environment is part of sharing a location." Sinister science is tackled by Professor Elizabeth DeLoughrey of the University of California in a view of nuclear fallout as climate change and the 50-year history of nuclear testing in the Pacific. She says that in response to the militarisation of the region, Pacific Island writers have reconfigured an alternative vision of what she calls solar ecopoetics, questioning the military logic of heliocentric metaphors. A number of writers touch on the tragedies and enterprise of migrations and movements in response nuclear testing, climate change and sea level rise, including Shaiza Janif of USP in a paper on narratives of lost lands, in which she tells of disappearing islands and eroding shores. A deep breath may be needed before plunging into University of Hong Kong Otto Heim's "Breathing space: Ecology and sovereignty in Pacific Island poetry'. He writes powerfully on the need to rethink notions of sovereignty and national self-determination in relation to ecology and place-based development, arguing for an imaginative reconceptualisation of established institutional spaces to make them answerable to the places they represent and open them to cross-cultural engagement. Oceanian traditions are suggested as relevant to institutional innovation. He uses Teaweiariki Tearo's beautifully balanced "steady waa", a poem in the shape of a canoe, to illustrate the balanced learning associated with ancestral and mentor relationships, and relatinships with sky, land and sea. A delightful breath of fresh air comes from Professor Ian Gaskell, formerly of USP and now of Central Queensland University with Tilting at Windmills, in which he attempts to combat the danger of "conservation fatigue" with fun provided by short play, One, Two, Three, Jump!, based on Torsten Lauschmann's World Jump Day. He suggests that some apparently unassailable corporate giants have figuratively disguised themselves as environmentally friendly windmills, and their creatively, cynical, exploitive marketing strategies using green-themed advertising may be more efficacious in actually changing attitudes and reducing our carbon footprint than a painting or a play. But perhaps that was before Jump hit the boards or Oceania writers, poets and painters got together for a conference on creativity and climate change. Seona Smiles is a Fiji author, journalist, columnist and social conscience who lives in Suva. More about this edition of Dreadlocks.